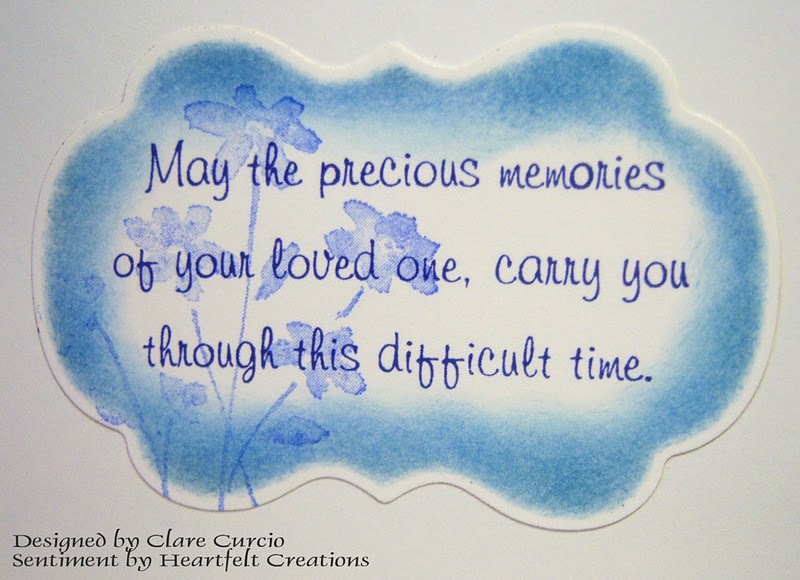 Clare's Paper Works: Heartfelt Creations Alumni Team Blog Hop! Heartfelt Creations Alumni Team Blog Hop! Hello! It's time for another Heartfelt Creations Alumni Team Blog Hop! I know you'll enjoy each and every blog you visit! Happy inspiration by some very talented ladies! 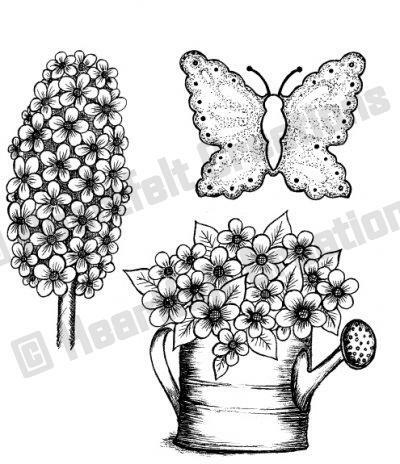 We will be giving away the Stamp Set HCPC 3306 Posy Patch Garden Delights Pre Cut Set. The winner will be randomly selected from comments received on all our blogs for the hop through midnight Thursday the 29th! The winner will be announced on Saturday October 1st on our blogs...wooo hoooo! I'm up first, but you may have come here from Linda's blogsite. No problem! Let's get to it! Enjoy! because I needed to make this card in a hurry. but I think the card looks like it took a lot of work to make. I thought the light blues helped make the card soothing. 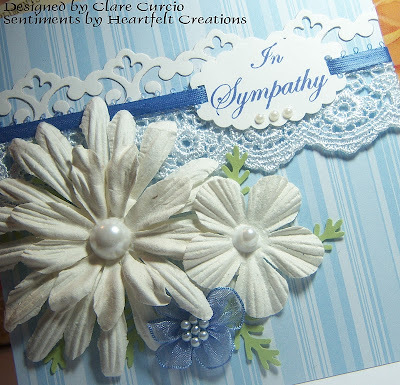 The sentiments on this card are from the Heartfelt Creations HCPC3377 Sympathy Sentiment PreCut Set. They are just wonderful, caring and simple. Other products I used to make this card are: blue striped cardstock from Stampin' Up, white cardstock, Stampin' Up Bliss Blue classic inkpad, Momento's Paris Dusk, Zva pearls, flowers from Prima, fern punch, ribbon and lace from stash, and Parisian Accents border die. Next up on the blog hop is the oh-so-talented Debbie! But before you go to her blog, please just take a second or two to leave me a note on what you think of my card. I appreciate all comments left! Thank you! Clare - this is where you are now! ABSOLUTELY GORGEOUS card! LOVE the soft blues! The lace and flowers are beautiful!!! Stunning and elegant!! Love the blue hues and the lovely sentiment! Thanks for sharing! 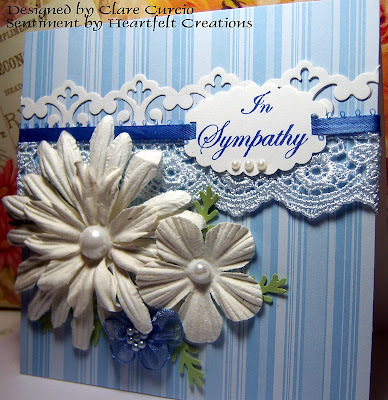 Beautiful card in blues...love all the elements that you used. This is a beautiful sympathy card. Love the soft colors. 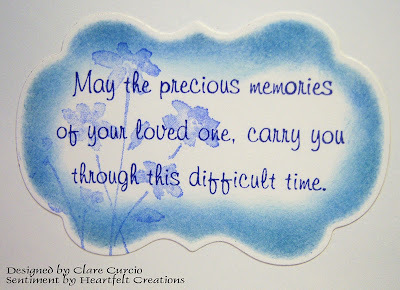 Lovely blues...lovely card...the sentiment is perfect...nice job! That is the one thing I love about HFC, they have the best sentiments, and are so easy to create with. Gorgeous card! A beautifully done card!! I love the blue crispness to it. Love the blues....your design is gorgeous! This is a lovely card. Very cute card, love the blues and flowers. A very lovely and like you say soothing type card. It is nice to see a pretty card, but like you say one that is also easy to make. I think you did a wonderful job. My thoughts before I read your statement on making this card were " My, what a lot of work and care went into making this card. It just has to make one feel cared about when getting it!" and then when I read about you making this in a hurry, I shouted out loud " No Way!". So see, even when you just throw something together, you can not help still giving it all the detail which shows that you care! Wish I could whip up something even half as nice as this! Great job! Hey Clare, I have to tell you that for a quickie this card is beautiful!! I love your arrangement and your right about the light blue, it does give it that soothing look, especially with the lace and the border you used!! Awesome job!! This is gorgeous, such pretty colors. Great idea on the blog hop and what a wonderful set to win. I left comments on everyone's blog, had some issues with several of them? Computer didn't want to let me in but I finally got them. Great hop and beautiful creations. Wonderful give a way. Eye catching card with fresh colours. Love it. This card is beautiful. TFS. Gorgeous! I do love the combination of blues. Very nice. Using the commercial made embellishments doesn't detract from your card at all. Sometimes they can be great time savers! Thanks for the inspiration! WOW! That is stunning! Love it!